Home » Active History Events • Canadian history • Does History Matter? At this year’s Canadian Historical Association meeting in St. Catharines, I participated in a round table discussion about war resistance. As the panel showed, war resistance history is a growing area of research, offering a different perspective on traditional histories of war, politics, international relations, and social movements. The panelists included Bruce Douville (Algoma University), Rose Fine-Meyer (University of Toronto), Marie Hammond-Callaghan (Mount Allison University), Geoff Keelan (University of Waterloo), and me (Independent Scholar), and was chaired and commentated by Lara Campbell (Simon Fraser University). As Lara Campbell queried before the conference, “Given all of the federal government focus on war commemoration, how might our work on war resistance contribute to a more complex/nuanced understanding of war? Do you think it is possible, in some way, to ‘insert’ the memory of war resistance into these sorts of public discussions?” Jamie Swift and Ian McKay’s book Warrior Nation: Rebranding Canada in an Age of Anxiety (Between the Lines, 2012) has kick-started a conversation about this topic, also highlighted in my book on the Canadian anti-draft movement. The book Campbell is co-editing with Catherine Gidney and Mike Dawson, Raise Every Voice: War Resistance in Canadian History, forthcoming from Between the Lines in 2015, will be another important contribution to this discussion. In “La Macaza: Two Canadian Peace Protests in the 1960s,” Bruce Douville described two 1964 protests at La Macaza, Quebec against the presence at the military base of American nuclear weapons. Members of several Montreal groups in the antiwar movement and on the left led the organizing. The protests were remarkable not for their size – both were fairly small in comparison to other antiwar protests – but for their strategies of nonviolent civil disobedience. As Douville observed, these tactics were enjoying popularity in 1964 due to the influence of the American civil rights movement. For Douville, the protests were significant for several reasons: because they marked the first such tactic in Canada, later used regularly in anti-war and other social movements in Canada; and because of the participation of a broad cross-section of movements, including both English- and French-speaking activists, separatists, leftists, and pacifists. His research provoked questions about how social movement history and war resistance should be incorporated into more mainstream narratives of Canadian history and, in particular, Cold War history. From the streets to the classroom, Rose Fine-Meyer described teachers’ interest in imparting peace and nonviolence to students in “‘The good teacher is a revolutionary’: Alternative War Perspectives in Toronto Classrooms, 1960s-1990s.” Teachers and their unions sought to promote peace in the classroom through the use of pedagogical material not included in the mandatory curriculum. Even the Toronto Board of education partnered with peace groups and supported such initiatives as guest speakers, newsletters and “peace festivals.” Fine-Mayer concluded by observing that, like today, teachers have often felt the impact of war in their schools and in their communities, and that the need to teach critically about war remains an urgent one. Groups such as Voice of Women for Peace (VOW) had an influence both on some of Fine-Mayer’s teachers and on the protests at La Macaza. Marie Hammond-Callaghan gave CHA participants a glimpse into the inner workings of this group, a prominent peace organization involved in 1960s peace movements. In “Bridging and Breaching Cold War Divides: Transnational Peace Building State Surveillance and the Voice of Women, Canada 1963-1967,” she summarized how war resistance history must be considered transnational. Locating VOW’s anti-nuclear and disarmament activism within a vital transnational movement which galvanized the forces of progressive women across the ideological spectrum, her paper foregrounded important and largely unconsidered questions about the political and cultural influence of civil society groups on each other across borders. For VOW, war resistance required steadfast defiance of the repressive panoptic effects of the Red Scare in Canada and abroad as well as subversion of a cold war paradigm heavily laden with gender norms. Geoff Keelan started his presentation by wondering if his topic fit well with the rest of the panel. As he described in “With Thought and Faith: Henri Bourassa’s Resistance to Canadian Participation in the Great War,” perhaps “few would describe [Bourassa] as a war resister,” because historians often think about resisting war in the context of social movement history or cultural history, rather than in relation to individuals. Further, Bourrassa, as founder of Le Devior and a prominent Canadian nationalist, is more likely to be considered by historians for his role in formal politics than as part of a history of war resistance. Bourrassa’s resistance to conscription and British imperialism through writing and electoral politics arguably places him within the boundaries of inquiry about war resistance, broadly speaking. In turn, seeing Bourrassa as a war resister brings an important nuance to an understanding of his historical impact: an indicator of just how broad our approaches need to be to account for a full picture. 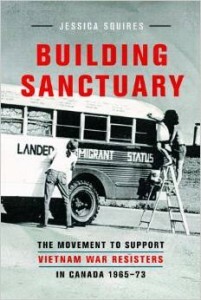 In my own presentation, “Building Sanctuary: the Canadian Anti-Draft Movement,” I made a similar argument about thinking in interdisciplinary and unconventional ways about this history. As I stated then, and wrote about in a previous Active History entry, the history of US war resisters is a fascinating window into the boundaries between various zones of geography, theory, and historical inquiry. Furthermore, the history draft resistance might also be considered part of the new political history, which looks closely at the way that the state interacts with a diverse component of actors. Perhaps all history needs to be explicitly situated within, without, or across boundaries in order to be fully appreciated. And, as the research of the presenters on this panel demonstrates, perhaps war resistance must also be broadly defined, with historical attentiveness to the context in which it evolves – histories of war, peace, religion, politics, foreign policy, the counter-culture, social movements, nationalism, and national identity. Jessica Squires is an independent scholar and activist who lives and works in Gatineau, Quebec. Her book on 1960s Canadian support for war resisters, Building Sanctuary, is now available in trade paperback from UBC Press.